Photographer Sara Black (L) and news reporter MJ Marfori (R) share how they use their love for photography to tell stories that inspire and empower others. Together with Teen Queen Kathryn Bernardo and actress Sofia Andres, these four women lead the Canon EOS M100 M-powered Women campaign. Manila, Philippines – With the increasing number of Filipinos owning basic smartphones and handheld cameras, anybody today can literally capture their daily moments and curate it into a piece of work or personal content. A world-renowned photographer once said, “Everyone’s camera can tell a story” – but how exactly can you turn these captured moments into powerful and meaningful stories that matter to people? Canon Marketing Philippines, Inc. (CMPI) teams up with four inspiring Filipinas to encourage more women to tell empowering stories in ways words cannot. Launched in 2017, the Canon EOS M100 is Canon’s most lightweight mirrorless camera body yet, weighing in at only 302 grams*, making it the best option to enable visual storytelling – may it be for personal use, or for new talents to get their work noticed. Not to be underestimated, this handy camera boasts of professional quality photos thanks to its 24.2 megapixel sensor, Dual Pixel CMOS AF, that can shoot up to ISO 25,600, 180-degree tilting LCD screen, and Full HD video shooting capability that is at par with the shooting power of DSLR cameras. Equipped with built-in Wi-Fi, NFC, and Bluetooth, the EOS M100 allows users to instantly share perfectly captured moments—making it the right companion for some of today’s women who excel in their respective fields: Kathryn Bernardo, Sara Black, MJ Marfori, and Sofia Andres. For actress Sofia Andres, a woman’s style is an extremely powerful tool when it comes to making her feel confident. “Everyone has their own unique style, and knowing your personal style is something every woman should give importance to. Style has the ability to transform women. It has the power to liberate,” said the 19-year old actress and model. 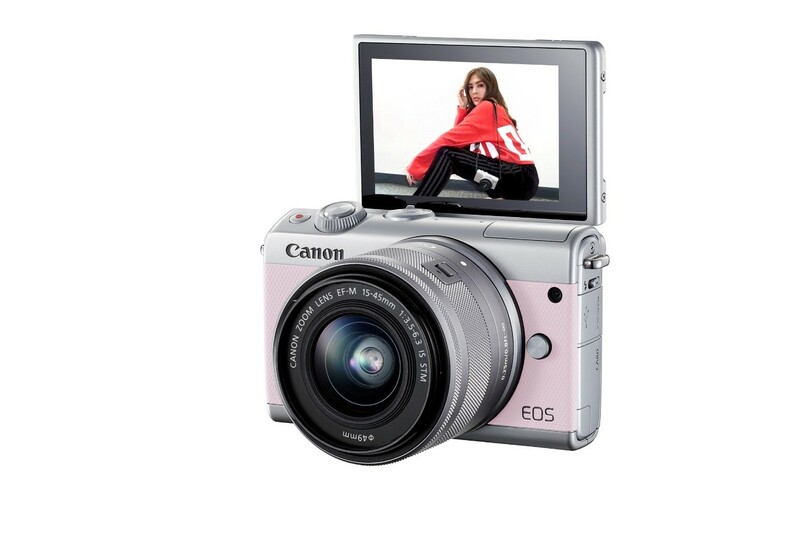 Characterized by its stylish and sleek design, the Canon EOS M100, is the perfect companion for the woman of style. Its Self-Portrait mode helps make sure users capture the best version of themselves through adjustments arnging from smooth skin tones to background blurring and more. It even comes in four colors - black, white, greige, and pink to match the users' style. Whether it's a quick selfie or a self-timed portrait, the EOS M100 is sure to capture the perfect shot to help women feel confident and beautiful. “Anybody can be a storyteller,” shared Sara Black, top professional photographer known for her evocative beauty editorial work. “But what makes a story stand out is having the right camera to perfectly fill that gap between people and the moments that tell stories,” she added. Equipped with Dual Pixel CMOS AF, the Canon EOS M100 provides precise focusing to deliver that depth for strong storytelling. The M100 even comes with face detection that offers an incredibly fast and smooth autofocus that stays locked onto the subject, even when it is in motion, to capture fleeting moments. Its built-in Creative Assist function offers a user-friendly interface that helps beginners and professionals alike to easily change camera settings and instantly see the results. “You don’t need to learn three years of photography to be able to perfectly capture moments. Everyone has the power to inspire. It’s not also something that’s exclusive to people with a huge number of social media following—it’s for anybody who wants to tell a story,” said Black. For TV host MJ Marfori, telling stories is at the core of everything that she does to help empower Filipinos, especially women. As a familiar face in news reporting to many, it has become her work and her passion to travel in different places to search and share meaningful stories across the nation. With the compact and lightweight design of the Canon EOS M100, it is easy to hold and carry anywhere for convenience without compromising quality. “My goal is to be able to reach and inspire people of different backgrounds through the stories I share,” she said. With the EOS M100’s handiness, built-in Wi-Fi, NFC, and Bluetooth for seamless connectivity, she is able to instantly share empowering stories captured in professional quality photos. Teen Queen Kathryn Bernardo shows off the Canon EOS M100 in greige. Enhancing the experience of taking photos by providing users with access to different creative choices, the EOS M100 is compatible not only with Canon EF-M lenses, which are tailor-made for EOS M series digital cameras, but also the extensive line of Canon EF and EF-S lenses available for other EOS cameras. “Having the option to choose and decide on what you want is for me – the ultimate freedom to express my creativity as a woman and tell my story in a single frame,” said Philippine’s Teen Queen and Canon Philippines ambassador Kathryn Bernardo. With its style, substance, and functionality, the Canon EOS M100 promises uncomplicated technology, handiness, connectivity, and uncompromising quality—making it the perfect companion for empowered women who want to share meaningful stories, one photograph at a time. Get the EOS M100 for Php33,998 SRP at Canon dealers nationwide until June 30, 2018 to get a free 16GB SD card and Php3,000 e-gift certificates via the Canon Red App. For more information, visit https://ph.canon/.